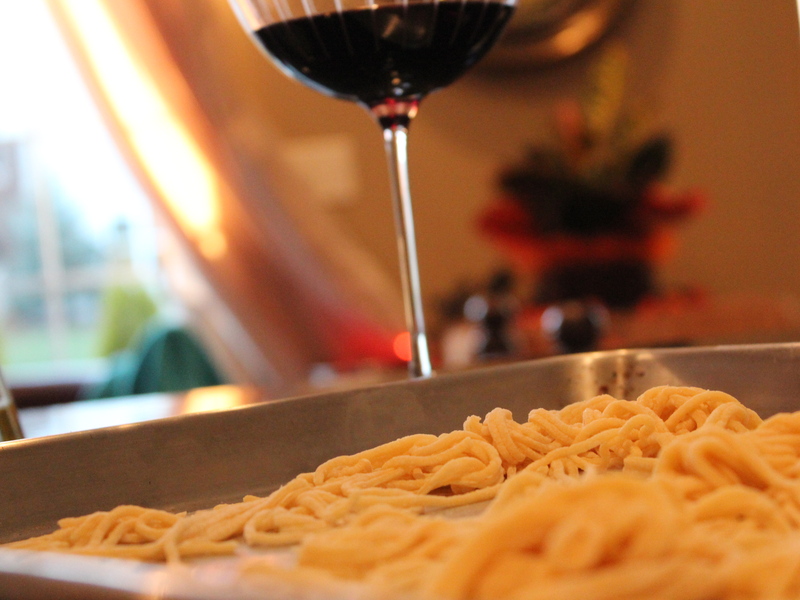 Last weekend we had a few friends over for some wine and, after we had some time to catch up, it was time for the girls to roll up their sleeves, crank up some Sinatra and begin concocting our own homemade spaghetti. The pictures below really speak for themselves thanks to my talented friend, Sylvia and my husband for taking some good photos. Speaking of talent, my other friend Georgette as well as Sylvia rocked it. 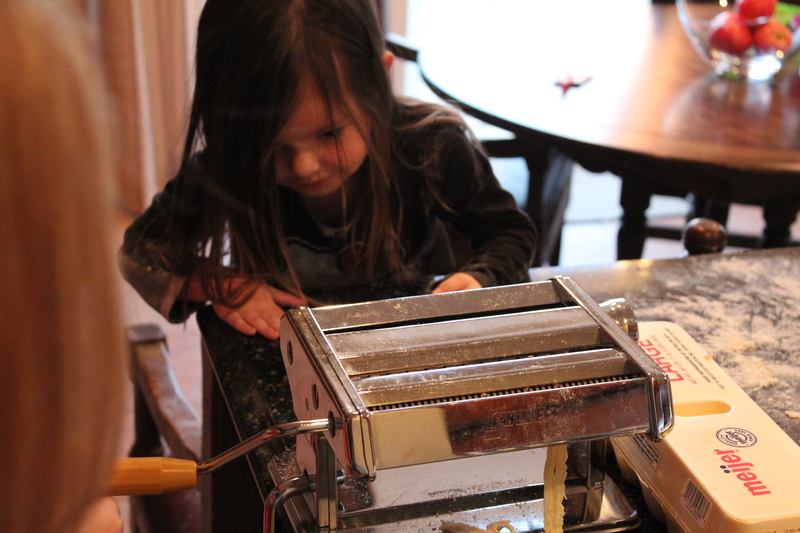 Their pasta turned out way better than mine…said the teacher who planned this little shindig. Just goes to show that newbies need not be afraid. 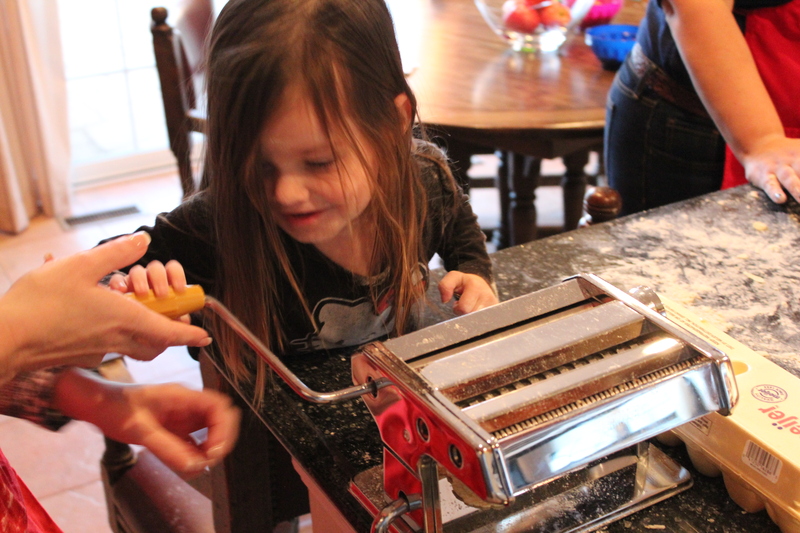 Grandma Cavallari’s Homemade Spaghetti-this was a fun recipe to learn in my husband’s grandmother’s kitchen years ago. She was and still is a very tidy cook, but I think if you end up with flour on the floor then you are doing something right. Enjoy! 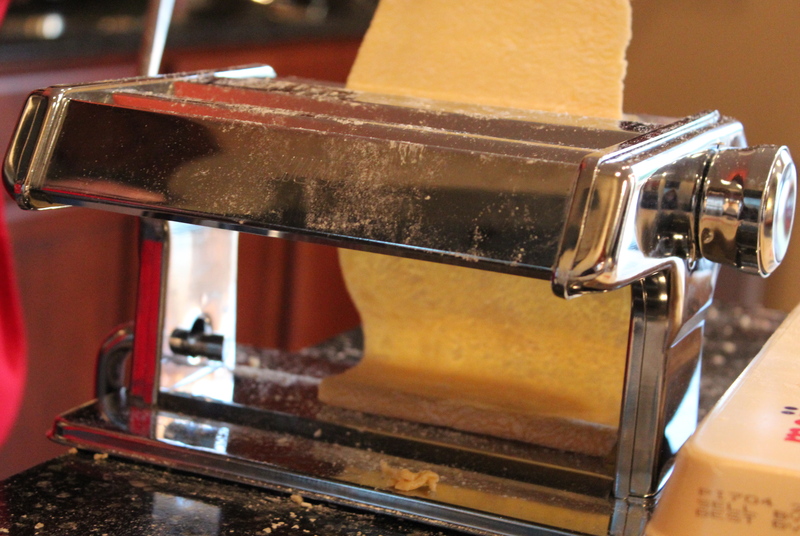 Please note that we used a pasta machine that can be anchored to the edge of your counter top. They also have attachments to stand alone mixers that you can use too. The process was pretty simple. Begin with setting a pot of water to boil on the stove adding enough salt to make it taste like the ocean. Measure about one and 1/4 cups of flour and pour onto a clean surface. Create a well in the middle that will resemble a moon crater. 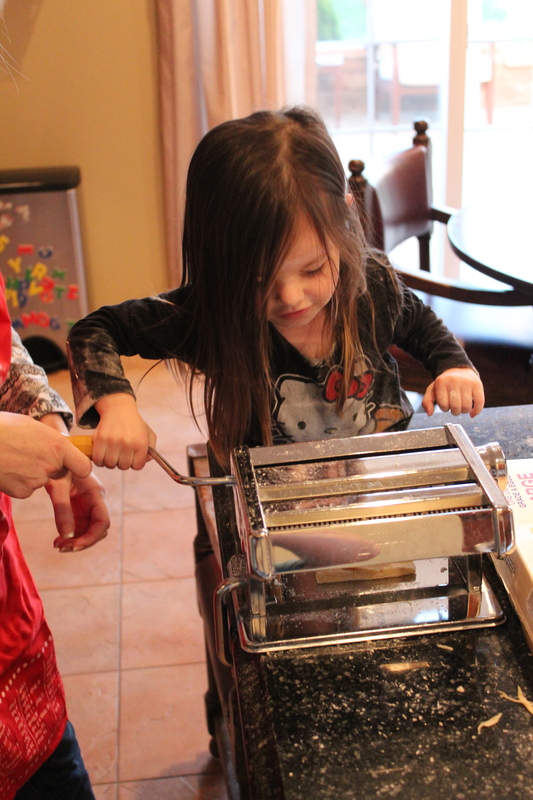 Then crack two eggs into the center of the well and begin to slowly work the dough through your fingers. 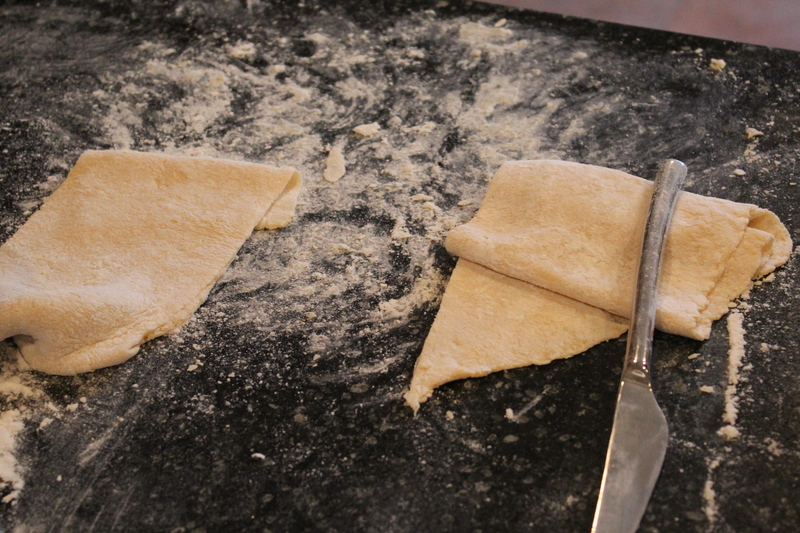 The dough will probably start off very sticky, but you can gradually add more flour as you need it. You are looking for a pliable consistency that is not sticky, yet not hard like putty. 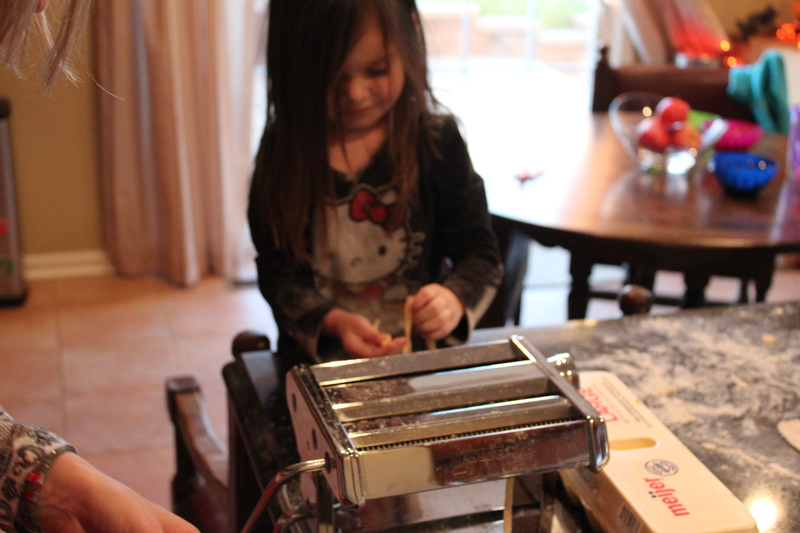 Then, using a rolling pin, roll out the dough and cut it small enough to fit into the pasta machine. 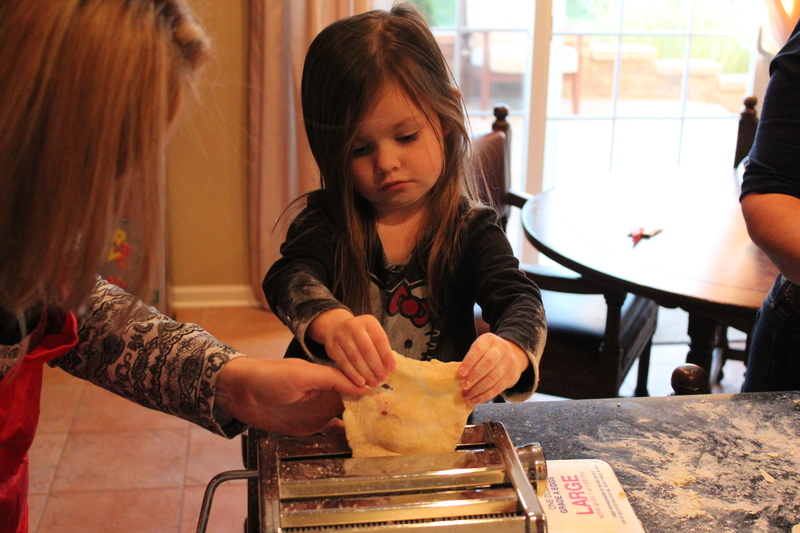 I am sure the size cut varies depending on the machine, but our dough pieces were about 3 1/2 to 4 inches wide. My machine had three different slots to crank the dough through. The first was the lasagne which we used first to flatten it out. Then, we ran it through the lasagne slot again to make sure it was even and thin enough. 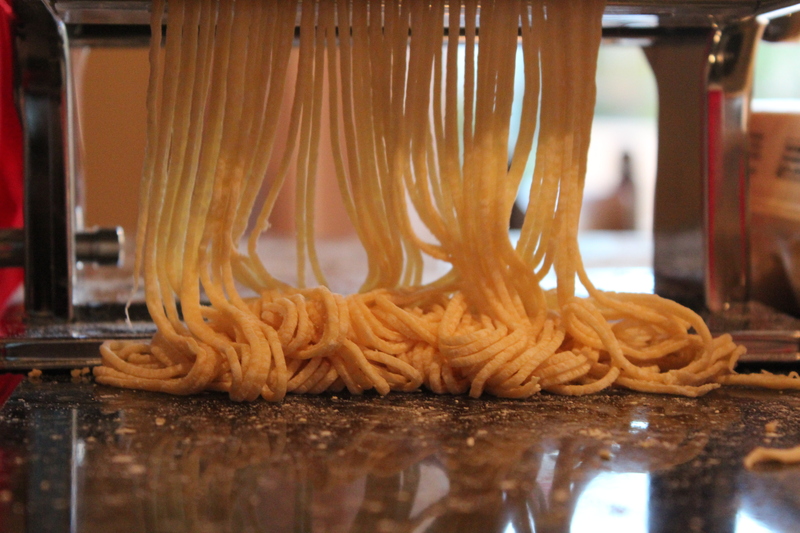 Finally, you run the dough through the spaghetti slot and you get a wonderful pile of spaghetti. 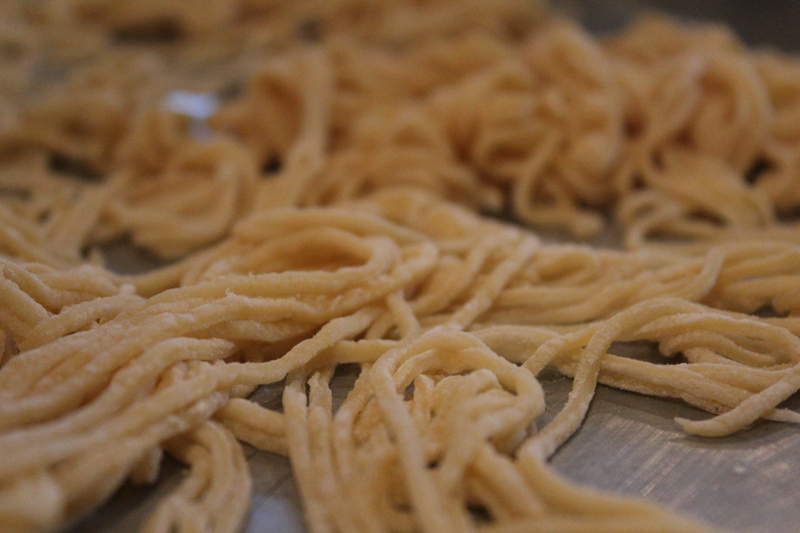 Place the spaghetti on a cookie sheet and keep working in batches. We went through a total of six eggs so it ended up factoring out to be one egg per person. Gently place the spaghetti into the boiling water and stir gradually. 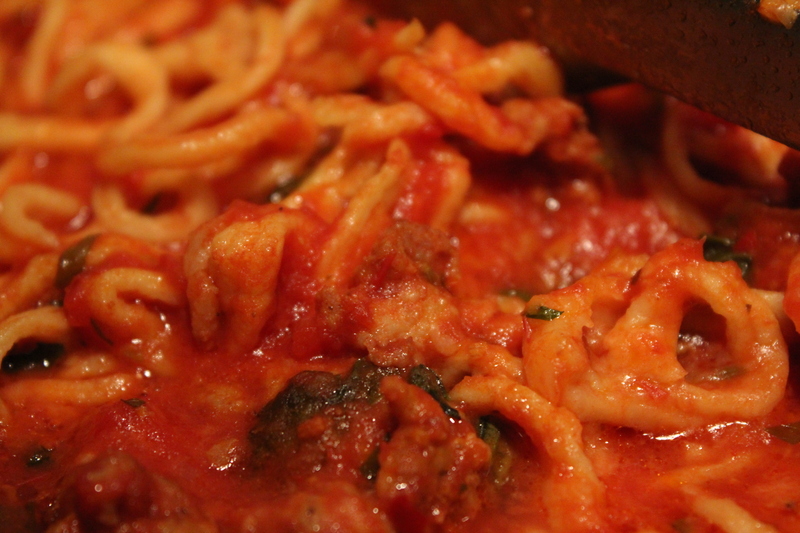 The pasta will cook very quickly and plump up a bit as it cooks too. Give it about a minute or two to cook stirring constantly and drain immediately. My three old daughter was having fun helping with the process so if she can do it, then we can all give this a try. Good luck!! 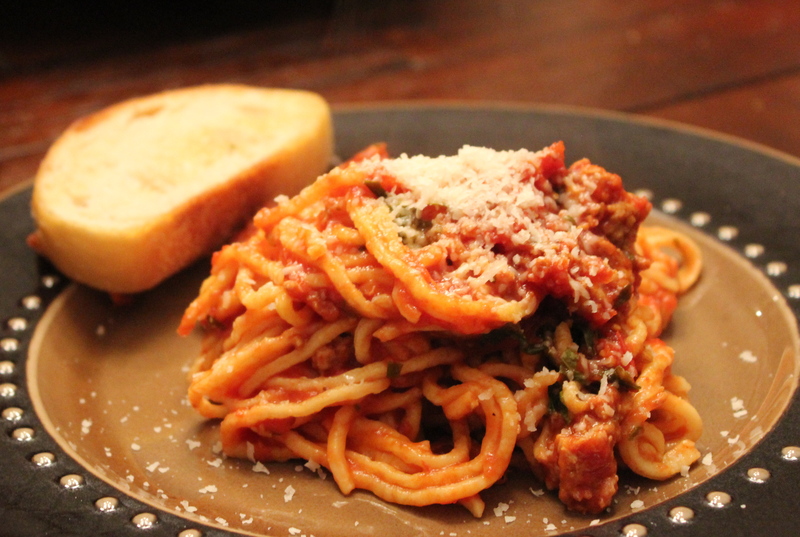 Tomato sauce with Sweet Italian Sausage- I made this sauce before my friends arrived to save on time. If you plan to do the same, just keep it covered with the heat on very low. Stir it every 7-10 minutes until you add the spaghetti. 1. Heat the olive oil in a large skillet over medium heat. Add the sausage and cook until brown, about 7 minutes. Add the tomatoes and cook for another 6 minutes. stirring everything together. 2. Add the garlic, bay leaves, fennel seeds and red pepper flakes to skillet. Scatter the saffron seeds over the mixture. Cook for about 2 more minutes. Add the parsley, 1 cup basil and 1 teaspoon Kosher salt. Reduce heat to medium and cook for 15 mintues stirring occasionally. Remove and discard the bay leaves. 3. Meanwhile, take the spaghetti you made above or boiled from a box (no judgement here) and drain reserving 1/2 cup of the pasta water to add to the sauce. Add the spaghetti and cooking liquid to the sauce and cook for about 5 more minutes. 4. Remove pan from heat. 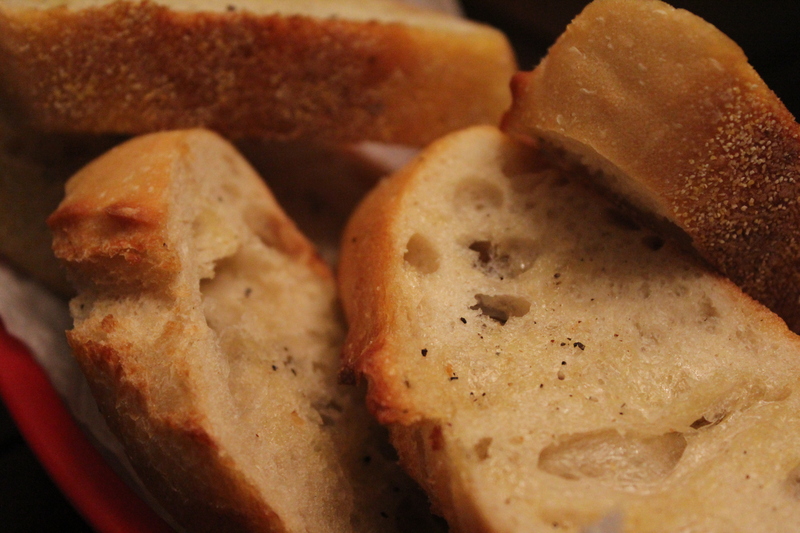 Add pecorino and remaining basil and serve immediately. Buon appetito!